The Place to Be for Business! 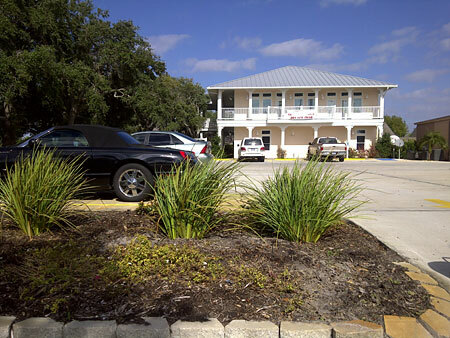 Nestled in the coastal oaks and located at the geographic center of Rockport is the Rockport Professional Centre. This ‘Bahamas style’ office park is unique to the coastal bend area, providing options from a single ‘lone eagle’ office space with full amenities, all the way up to a pad site ready to accommodate your own single or two story custom office building. Quality, privacy and style combined with a prestigious location at the entrance to the Rockport Country Club make the Rockport Professional Centre the best choice for your new business home. Building 1 is a colorful two story building designed with the last attention to detail, including low maintenance, high quality Hardie light concrete siding and Trex decks and railings. The wrap around deck and separate entrances to every suite provide an open, casual business environment, while the glass enclosed conference room, granite European kitchen bar, designer colors and art, concrete parking and well-landscaped grounds, including your own professional putting green, create an elegant environment. Add to that the full complement of services including free wifi, janitorial services, and extensive phone and internet wiring, and you have everything you need for your ultimate business location. Casual yet elegant, designer quality in a very affordable package makes the Rockport Professional Centre your first choice. Whether you need an individual office, a suite of offices or your own building, call today to set up your own private showing, and let’s get started designing the next successful chapter of your business future.